Proper maintenance is the key to preserve quality & precision of your instruments. Below are three key elements to avoid many of the common mistakes that lead to instrument failure. Fine surgical instruments should be cleaned immediately after use. Blood or saline solutions left on instruments for any length of time can quickly start corrosive action. Wipe instruments carefully to remove all blood and tissue matter. Thoroughly rinse instruments with distilled water. Follow the manufacturers guidelines for specific instructions and cleaning cycle times. Immediately after either manual or ultrasonic cleaning, dry instruments thoroughly - a pneumatic air gun or hairdryer is also can be used. Max. drying temeratures should not exceed 100 deg C.
It is important that instruments are free of all traces of organic or other matter prior to sterilisation. The steam used must be from distilled water and free of all impurities. Do not mix instruments of inferior quality or unknown alloys in the autoclave with your higher quality instruments. Follow the manufacturers guidelines for specific instructions as well as cleaning cycle and drying times. Remove and thoroughly dry instruments immediately after autoclaving. Recommended for speed and convenience when instrument tip or blade sterilisation is required. Instruments should be stored so as to not touch one another and should be kept as clean and free of dust as possible. All stainless steel surgical instruments are manufactured from medical grade stainless steel under strict International standards. Stainless steel instruments are immune from corrosion. Under unfavorable conditions instruments may oxidize because stainless steel that is exposed to physical, thermal or chemical manipulation may lose some of its stainless properties. To prevent corrosion always make sure you use instruments for their intended purpose and follow the guidelines outlined on this page for instrument care. Make sure that the instruments are only used for the purpose for which they have been designed. Handle your instruments delicately and with care being careful not to over strain or drop them. Clean and thoroughly dry your instruments as soon as possible after each use, paying special attention to overlapping surfaces. Instruments should be handled gently Check carefully every instrument for damage after use, before storing. Give special attention to fine instruments. These can be easily damaged by contact with other instruments. It is important that you check the hardness of the water used in the Autoclave, Water, which is too hard, will leave a deposit on the instruments. Make sure that the detergent is at the recommended strength if ultrasonic or cleaning machines are being used. Make sure you clean and decontaminate all instruments in warm water immediately after use. Failure to do so may result in the instruments becoming stained and the joints stiff. Do not leave soiled instruments to dry. If it is impossible to clean them immediately after use, soak them in cold water. Never leave any instrument soaking in chemical sterilising solution for a longer period than necessary. All chemicals should be removed from instruments. Instruments should be lubricated after every cleaning process with a water-soluble lubricant and must be thoroughly dried before being stored. Never use abrasives on instruments. This will spoil the surface finish and may later cause pitting, discoloration or rusting. “Decontamination is the combination of processes (including cleaning, disinfection and sterilization) used to render a reusable item safe for further use on patients and handling by staff. The effective decontamination of reusable surgical instruments is essential in minimising the risk of transmission of infectious agents” (NHS estates 2003). The importance of thorough decontamination and re-processing of instruments is highlighted above and Surgins Surgical LTD advises that you follow their reprocessing instructions. Instructions for Reprocessing of Reusable Devices The following instructions are for all reusable medical devices supplied by Surgins Surgical LTD, unless stated otherwise with the packaging of the product. These instructions are intended for use only by persons with the required specialist knowledge and training. Follow instructions and warnings as issued by the manufacturers of any decontaminants, disinfectants and cleaning agents. Wherever possible avoid use of mineral acids and harsh, abrasive agents. No part of the process shall exceed 140ºC. Some sensitive materials (e.g. Aluminium) are damaged by high alkaline solutions (pH>10). Devices with long, narrow cannula, hinges and blind holes require particular attention during cleaning. Note: When reprocessing medical devices, always handle with care, wearing protective clothing, gloves and eyewear in accordance with local Health & Safety procedures. Repeated processing has minimal effect on these instruments. End of life is normally determined by wear and damage in use. Any specific limitations on the number of reprocessing cycles shall be made available with the instrument. FROM POINT OF USE Wherever possible, do not allow blood, debris or bodily fluids to dry on instruments. For best results and to prolong the life of the medical device reprocess immediately after use. If they cannot be reprocessed immediately, use an enzymatic foam spray cleaner to help prevent soil from drying. Reprocess all instruments as soon as it is reasonably practical following use. Disassemble only where intended, without the use of tools unless specifically provided by the manufacturer. Where instructions for disassembly are required, these are available with the device. Use only either CE marked or validated washer-disinfector machines and low foaming, non-ionising cleaning agents and detergents following the manufacturers instructions for use, warnings, concentrations and recommended cycles. Load instruments carefully, with any box joints and hinges open and so that any fenestrations in instruments can drain. Place heavy instruments with care in the bottom of containers, taking care not to overload wash baskets. Place instruments with concave surfaces facing down to prevent pooling of water. Where available, use appropriate attachments to flush inside reamers and devices with lumens or cannula. Ensure that soft, high purity water which is controlled for bacterial endotoxins is used in the final rinse stage. Note: Automated cleaning may not be suitable for all lumens and cannula in which case clean manually with a water jet gun, if available, and an appropriate brush (and stilette if provided) that reaches the depth of the feature. After manually cleaning, pass all devices through an automatic cleaning cycle to achieve disinfection. Note: These instruments have been validated using a washer-disinfector cycle validated to include two cold rinses at <35ºC, a detergent cycle and a rinse cycle both at >50ºC, a disinfection cycle operating at a temperature of between 80ºC and 87ºC for a minimum holding time of 1 minute (actual holding time in excess of 2 minutes 50 seconds) and a 20 minute drying cycle. The detergent used was low foaming, non-ionising spray wash detergent cleaner (max 12pH) and the rinse aid a neutral pH low foaming, non-ionic surfactant with isopropyl alcohol. CLEANING: MANUAL Manual cleaning is not advised if an automatic washer-disinfector is available. Use a double sink system (wash/rinse) dedicated for instrument cleaning (not used for hand washing). Ensure that the water temperature does not exceed 35ºC. In the first sink, keeping the instrument submerged, with an autoclavable brush, apply CE marked cleaning solution to all surfaces until all soil has been removed. Pay particular attention to serrations, teeth, ratchets and hinges, always brushing away from the body and avoiding splashing. Ensure rongeurs and hinged instruments are thoroughly cleaned in both open and closed positions. In the second sink, rinse instruments thoroughly with soft, high purity water which is controlled for bacterial endotoxins, so that the water reaches all parts of the instrument, then carefully hand dry or use a drying cabinet. Note: Manual cleaning is NOT a disinfection process: When manual cleaning is used it may not be possible to disinfect the device prior to further handling. CLEANING: INSPECTION After cleaning, visually inspect all surfaces, cannulations, ratchets, joints, holes and lumens for complete removal of soil and fluids. If ANY soil or fluid is still visible, return the instrument for repeat decontamination. MAINTENANCE Apply surgical grade lubricant to hinges, joints and moving parts as per the lubricant manufacturers instructions. Visually inspect and check:- all instruments for damage and wear; cutting edges are free from nicks and present a continuous edge; jaws and teeth align correctly; all articulated instruments have a smooth movement without excess play; locking mechanisms (such as ratchets) fasten securely and close easily; long, slender instruments are not distorted; any component parts fit and assemble correctly with mating components. Remove for repair or replacement any blunt, worn out, flaking, fractured or damaged instruments. Note: If an instrument is returned to the manufacturer / supplier, the instrument must be decontaminated and sterilised and be accompanied with the relevant documented evidence. PACKAGING All instruments to be packed following local protocol in accordance with BS standards. Either CE marked or validated vacuum autoclave operating at 134-137ºC bar for a minimum holding time of 3 minutes – always following the instructions of the machine manufacturer. When sterilising multiple instruments in one autoclave cycle, ensure that the steriliser manufacturers stated maximum load is not exceeded. Ensure instruments are dry before sterilisation. STORAGE Ensure instruments are dry before storage, and stored in dry, clean conditions at an ambient room temperature. Other forms of cleaning (i.e. ultrasonic) and sterilisation (i.e. Low temperature steam and Formaldehyde, Ethylene Oxide and Gas Plasma) are available. However, always follow the instructions for use as issued by the manufacturer and always consult with them if in any doubt over the suitability of any process used. 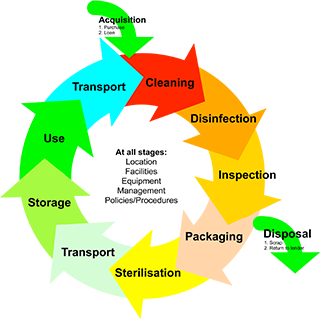 Cleaning and sterilising guidelines are available in HTM 2030 and HTM 2010. Contact: The NHS Estates Stationers Office Publications Centre for details at www.tso.co.uk. For further information contact: NHS Estates Information Centre, Department of Health, 1 Trevelyan Square, Boar Lane, Leeds, LS1 6AE, UK or visit www.nhsestates.gov.uk. Note: It is the responsibility of the reprocessor to ensure that the reprocessing as actually performed using equipment, materials and personnel in the reprocessing facility achieve the desired result. This requires validation and routine monitoring of the process. Likewise any deviation by the reprocessor from the instructions provided must be properly evaluated for effectiveness and potential adverse consequences. Manufacturer: call +44 (121) 709 0101 or E-mail info@surgins.co.uk.